Stephanie Balcazar, Esquire is a dedicated attorney who represents clients in criminal matters ranging from misdemeanors to serious felonies in Orange, Osceola, Seminole, Polk, Lake, and other counties. Attorney Balcazar takes a client-centered approach to all cases, understanding the importance of listening to each client and zealously representing them. Originally born in Atlanta, Georgia, Attorney Balcazar spent most of her years in Florida, where she attended one of the top 10 best U.S. colleges for a Bachelors of Arts in Criminology, the University of South Florida. She then attended Western Michigan University Cooley Law School where she earned her Juris Doctor degree and was Vice Chief for the Moot Court Team where she gained extensive training in appeals. In addition, her focus in law school extended to both criminal and family matters. Additionally, while attending law school, she worked full time as a Contracts Manager for a $214 million non-profit that handled various programs from substance abuse and mental health to guardianship. She also worked diligently with the Children and Family Services Program and Immigration. Once she graduated from law school and upon passing the bar, she additionally became an In- House attorney representing the non-profit corporation in administrative hearings and employment law. She went on deciding to pursue her reason for becoming an attorney and follow her true passion to represent clients in criminal matters. 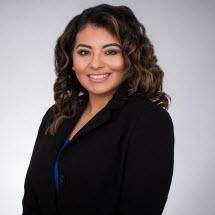 Since joining The Figueroa Law Firm, P.A., Attorney Balcazar uses her background, diverse legal experiences, and legal training to support the legal positions of her criminal law clients. She ensures that her clients have a realistic understanding of all their options to resolve their cases allowing them to make an informed defense strategy. Attorney Balcazar is passionate about her client’s matters and believes a caring attorney is the only way the criminally accused can receive the protections of the United States and Florida Constitutions. Attorney Balcazar is also fluent in Spanish, and in her spare time she enjoys spending time with her family and working out.